OpenQuest 2 pre-order now open! 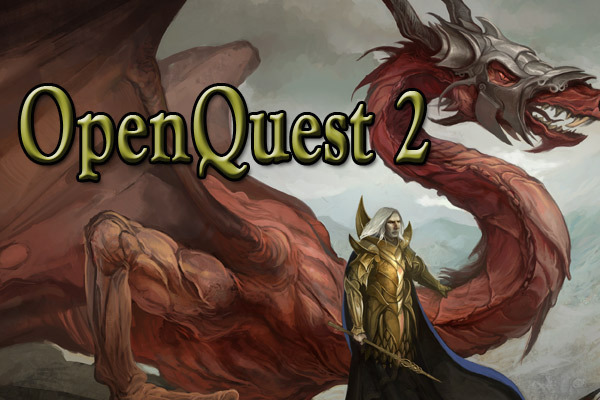 It is with great pleasure I formally declare the pre-order for OpenQuest 2 open! The pre-order will run until October 26th, with the rule book going to print shortly afterwards. At the bare minimum OQ2 will be available as a tided up version of the current rules, with new art to replace the clip art in the current version and in pdf/soft-cover and HARD-COVER. What’s more if the goal amount of the pre-order is exceeded then things start to get interesting, as I will then start adding new and expanded content to the book. Also up for grabs is a new cover by Jon Hodgson, which the campaign banner/logo below previews part of. So if you are an OQ fan and want to see a new expanded edition, that is 99% backwards compatible, with the first edition, please visit the pre-order page. Even if you just want to get the new content by downloading the new OQ2 Dev Kit, its worth donating as the more the Goal is exceeded the more content will be made available. If I was a betting man, which I am, I’d gamble on you hitting all your stretch goals before the start of October.